I'm on the lookout for colour block shoes. Marni would be ideal, but if I can find an affordable version, that would be great! 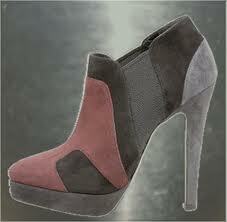 Colour mixes such as pink/red, coral/grey, green/black, burgandy/brown are really catching my eye. Here are some I would love to own. Love the blue bow on this Marni pair. Feb 16 NY Fashion Week: Nigel Barker with HAIR?